I started to work in a lab, where the focuses are molecular ecology and evolutive genomic. One of the projects is the genomic characterization of different samples of Pyura Chilensis, because we think that there are different ecotypes among the samples we're studying. I'm an undergraduate student at Universidad Austral de Chile, currently studying Biochemistry, and my aim into this laboratory and project is to help the team with their biggest problem: obtaining high quality, pure and good concentrations of gDNA from the Pyura samples. When we extract the DNA, the result is completely degradated DNA (we can tell it by doing the EPs). We've allways used GeneJET Genomic DNA purification Kit (by ThermoFisher), and when we use it on other samples (I mean other species) it works beautifully, so the kit isn't the problem. We've always used tissue storaged, but the problem always appears even if the samples are one day old (and storaged) or even years old (We use Ethanol 95% for storing, and we wash the samples with Ultra Pure water before starting the procedure with the kit), but the storing method seems to be good for extracting gDNA in other species. Then, my guess is that the problem is the Pyura itself (lol). So I have to figure out if either the extraction or the storage isn't appropiate for Pyura. I read that this Pyura thing has a lot of cupper within it, then we're going to use a new buffer for storing it (Salt Saturated DMSO, containing EDTA), and I'd like to perform another methods for the DNA purification (something more classic, like phenol/chloroform or something). Finally , after the tedious contextualization, I would like to ask if any of you have ever worked with this organism (and if you have, what did you do and how did you managed it. I think that most of the time there's someone more experienced, and perheps someone already went through this) and what are your recommendations for solving my problem. If you know any technique for obtaining the DNA the way I described you (we need to sequence it), ways of storing (for example, would it be better if we extract the DNA and we store it instead of the tissues? Once we achieve the way of obtaining good DNA, of course; or if you think that the new buffer will work; or your recommendations when we do PCR because of the EDTA), or any advice, anything will help me and I'll be profoundly grateful (if I can achieve my aim, maybe my professor puts it into an article and my name appears on it, such a thing for an undergraduate hahaha). Thanks in forehand for reading and helping (and excuse me for my bad english, it's not my mother language). Greetings. That looks like a usual gDNA extraction. A bit degraded, but the samples next to the ladder seem to be degraded too. 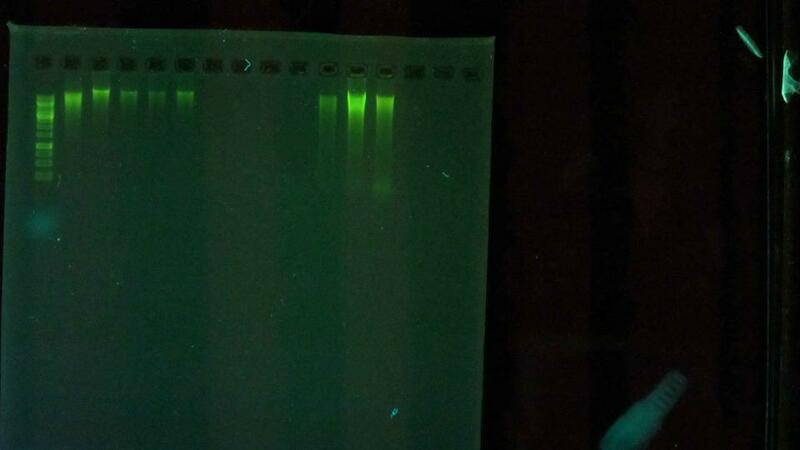 In any case normal electrophoresis gels are not good at all for a proper assessment of gDNA size. When you get into long-read sequencing you realise how nearly-useless they are, esp if you are targeting HMW-DNA. All depends on what you want to do. If you are planning on doing any usual short-read or Sanger-based thing, it will probably do (contaminants aside...) but if you want to do any long-read sequencing you'll probably need to run PFGE to be sure if it's good or not.